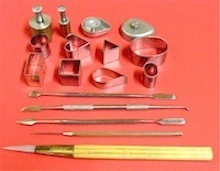 Your range of pmc jewelry tools does not need to be large. Most can be found in your kitchen and around the house. You don’t need to have any fancy tools to roll out PMC. 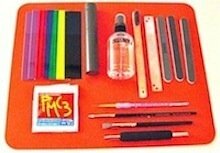 Most local craft or hobby stores will probably carry the basic Pmc jewelry tools you need. 1. Silicone sheet or any non stick surface. Place your clay on this sheet for rolling. 2. Acrylic roller this can be a 1 inch diameter piece of pvc tubing or a acrylic rolling pin 4 to 6 inches long for rolling your PMC jewelry pieces. 3. Graduated slats are plastic strips of various thicknesses which are placed at each end of the roller to give the correct thickness to the rolled PMC silver clay. Playing cards can also be used for this purpose. 4. Badger Balm is used to stop the precious metal clay from sticking to the work surface, texture sheets, push molds and your hands. Olive oil or vegetable oil can be used instead. 5. Paint brush either flat end or pointed used to keep your art clay moist and lots of other little jobs you may have. 6. Tissue Blade or craft knife used to cut your precious metal clay shapes. 7. Files or wet and dry sandpaper used for cleaning up your dried piece of PMC silver clay. 8. Hot Air Dryer of some kind – hairdryers are the obvious one or a coffee cup warmer will also work for drying your precious metal clay piece. It MUST be leather hard before you attempt to work on it or fire it. Things to make your designs easier. There are many commercially produced texture plates and stamps available from craft and hobby stores as well as online stores. These textures come in different materials – brass, plastic and rubber. 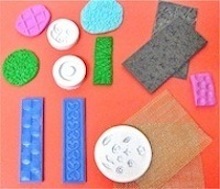 You can also make your own texture plates with polymer clay or two part molding putty. Making your own textures gives you a lot more freedom to create your own PMC jewelry designs. Textures can be taken from lace, rice, leaves etc. Molds are normally made out of latex which makes it very easy to release your piece of precious metal clay. There are an enormous variety of commercially produced molds for use with PMC silver clay and polymer clay artists. You can make your own from two part molding putty. Cutters – mini cookie cutters are used to cut out shapes in the precious metal clay. There are two types of cutter either the plain cutter or the push cutter which is spring loaded to push the clay from the cutter. Many of the tools used in polymer clay are also used in precious metal clay such as the shapers. These can be used to shape and add detail to your piece as well as used to make corrections to your design. The burnishing tools are used to either completely polish your piece or add patina highlights to your PMC silver. Burnishing brush. After you fire your PMC piece it becomes white. Use a soft brass brush to burnish the surface – it produces a soft satin finish. 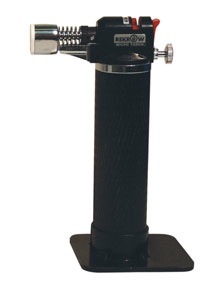 For a high shine use a hand burnisher or an electric tumbler. Needle Tool used for poking holes in your clay piece. Toothpicks can be used instead. Firing Your Piece of Precious Metal Silver Clay to burn off the organic binders and water.You can use stovetop, butane torch, trinket kiln, microwave kiln or a programmable PMC kiln. A wide range of tools and supplies can be found at the Silver Jewelry Clay section of Delphi Glass.